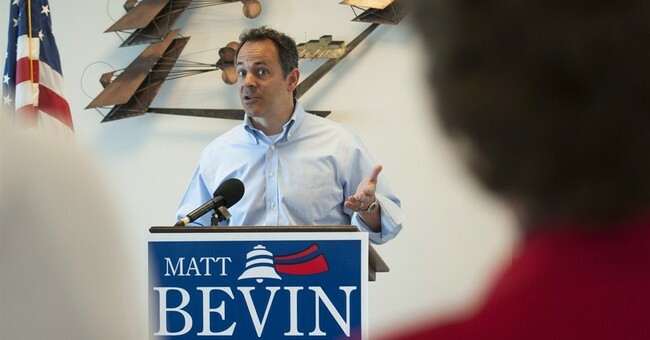 I wrote in this space earlier this year that the race for Kentucky governor is as good a bellwether as is available for the 2016 presidential race. It’s a better indicator than polls. Answering poll questions on the phone is a different thing indeed from getting in the car and driving to the polls. For those out of state folk that may not have kept up with Kentucky (it’s understandable, who has the time?) our race pits a conservative political outsider, Matt Bevin, against an entrenched long term Democrat politician, Jack Conway. As a result Bevin has been viciously attacked. The unconscionable, never ending onslaught of negative ads (which have been proven patently false by politifact and many other fact checkers) run against Matt Bevin, first by Mitch McConnell, and now by Jack Conway (those ads containing the same false accusations…strange bedfellows these Kentucky politicians) are unfair, but not unexpected in the bare knuckles world of political opposition. To be sure, one should expect attacks from the left upon a conservative like Bevin, who seeks to break the left’s stranglehold on the Kentucky Governor’s mansion. However, what frustrates me in the extreme are attacks from self-proclaimed conservative media in Kentucky. In a commonwealth that has been run by Democratic Governors for seventy-six of the last eighty-eight years, and which has a 22% debt to GDP ratio, over 96,000 citizens out of work, ranks 47th in overall health, and 48th in child poverty, all some conservative media can think of to write two weeks before the election are gallons of words criticizing the one conservative in the governor’s race? In one piece, the writer decries the so called “right wing ideologues” (one too many episodes of The O’Reilly Factor perhaps?) who are usurping “his” GOP. He calls an honorable statesmen like the Princeton and Harvard graduate Ted Cruz, a “demagogue” who “puts self- interest first and the nation second”. This would be the same Ted Cruz who clerked under one of the great modern day Chief Justices of the Supreme Court (Rehnquist) and who has argued nine cases before the U.S. Supreme Court fighting for the conservative principles that built this country. This is a man whom the columnist presumes to dismiss with a pejorative? It is precisely because of the pseudo-intellectualism of supposedly right of center columnists and journalists like these that Trump even exists as a candidate in the first place, much less as the GOP frontrunner. Despite what some in the establishment seem to think, the American people are not stupid. They sense this republic slipping away, and it is crystal clear to many that the Grand Old Party has done darned little with its control of Congress to stop the slide. One need look no further than the recent budget deal, celebrated Bohner. This deal is a total surrender to Harry Reid and Barack Obama. It annihilates the 2011 budget caps and increases the national debt by 1.5 trillion dollars. So as a citizen of a nation 18 TRILLION dollars in debt, am I supposed to stand up and applaud because this bill uses smoke and mirrors to “reform Social Security” as McConnell stated today? Should I be excited? Am I a “right wing ideologue” because I think this is an inherently bad idea? Men like Matt Bevin, Ted Cruz, and Ben Carson are not the problem with the Republican Party. They are the beginnings of a solution. Still, in a tone similar to your nearest liberal columnist, the name calling is not over. Another column, in a most odd criticism from a supposed conservative aimed at fellow conservatives, calls men like Cruz and Bevin “Jacobins.” That’s ridiculous on its face. Jacobinism was magnificently criticized by the father of conservatism, Edmund Burke, and again by the father of American Conservatism, John Adams, and by every right thinking conservative since. One would think a “conservative” would know better. One columnist concludes by saying that because of the up and coming conservative wing of the party that “his” GOP weeps. Well, fellow columnist, with the full funding of Obamacare, Obama amnesty, this horrendous budget deal and no appreciable resistance by “his” establishment GOP lead congress to anything Obama and Reid’s hearts’ desire… my nation weeps. With the aforementioned debt, joblessness, and needlessly low rankings… my state weeps. It is my hope and prayer that on Election Day next Tuesday, and with the election of a solid conservative Governor and Lieutenant Governor, the weeping will begin to subside.